Not sure what to give that special someone? Choose a One Leaf Gift Voucher and let your gift be their choice! Everybody has unique tastes and their own style that makes buying gifts tricky at times. Don’t worry we have you covered! This is the perfect option if you are not quite sure what to get and gives that special some one free reign over their ideal gift. Once you have purchased a One Leaf Gift Voucher you will receive an email to which you can respond with a personalised message. You can even attach a photo to create a personalised stamp. This personalised Gift Voucher will then be emailed to you. Print and fold into a postcard to give as the perfect gift. 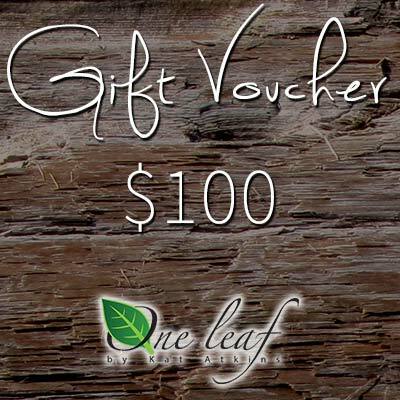 The One Leaf Gift Voucher will include a unique code for the lucky person to enter at the checkout on this website. *To use this Gift Voucher on the One Leaf website, enter the Gift Voucher Code in the ‘Apply Coupon’ field. Gift Vouchers are non-returnable, cannot be redeemed for cash and can be used in part or in full. Where the purchase cost of product + delivery cost exceed the value of the gift card, additional charges apply.